Activity of isocitrate dehydrogenase, α-ketoglutarate dehydrogenase, malate dehydrogenase, and the NAD+/NADН ratio were studied in the liver mitochondrial fraction of rats with toxic hepatitis induced by acetaminophen under conditions of alimentary protein deficiency. Acetaminophen-induced hepatitis was characterized by a decrease of isocitrate dehydrogenase, α-ketoglutarate dehydrogenase and malate dehydrogenase activities, while the mitochondrial NAD+/NADН ratio remained at the control level. Modeling of acetaminophen-induced hepatitis in rats with alimentary protein deficiency caused a more pronounced decrease in the activity of studied Krebs cycle NAD+-dependent dehydrogenases and a 2.2-fold increase of the mitochondrial NAD+/NADН ratio. Original Russian Text © O.N. Voloshchuk, G.P. 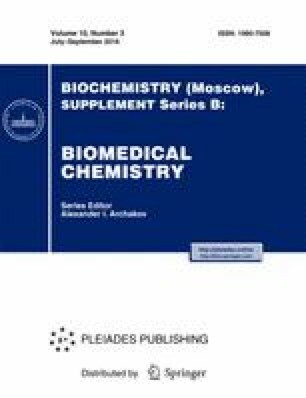 Kopylchuk, 2016, published in Biomeditsinskaya Khimiya.